Occasionally I do a “sense check.” Auditing one’s own work is problematic but I try to be objective. Entries #300 and #301 are the most recent standard “sense checks.” Entries (#310-#313) broke from conversation format. Occasionally I do a “sense check.” Auditing one’s own work is problematic but I try to be objective. Entries #300 and #301 are the most recent standard “sense checks.” The previous four entries (#310-#313) broke from conversation format. Characters return with this entry. Scene: Jordan’s office, Washington, DC, start of workday. “Can We Talk about Economics” conversation began Entry #308. #243 Primer Cha 8: “What’s Good for General Motors is Good for the Country.” Still True? The question about validity of government bailouts is valid…but the conclusion is not correct. The U.S. needs a healthy domestic auto industry but for reasons that many people may not have considered. What makes me an expert? My comments are based on some fundamental laws of economics and 40+ years in the auto business. The auto experience includes being inside a large auto company as well as starting several companies offering hybrid-electric or 100%-electric drive systems. I’ve been in technology centers, on factory floors, in boardrooms, in design centers and in dealership showrooms and service bays. I’ve been involved with some good, some bad and some ugly projects. So why is a successful domestic auto industry so important? Three fundamental reasons: (i) ensuring advanced technology is readily available inside the country to auto and other industries; (ii) stimulating growth in other industries (iii) helping ensure national security. What makes the auto industry different from most other industries is a combination of large-scale, complex manufacturing and demands for extremely high levels of reliability and durability, especially compared to other products. Everyone I have ever met who entered the auto industry after time in another industry makes the same comment after 2-3 weeks, “The auto business is much more complicated than I realized.” And the comment usually includes several expletives. ENSURING AVAILABILITY OF ADVANCED TECHNOLOGY. What does the auto industry do that cannot be done by the defense or aircraft industry? The answer is volume. High volume drives down cost and lower cost makes products affordable for many more consumers. While much new technology is developed in defense and aerospace industries, neither industry generates the volume necessary to drive down cost significantly. Think about the number of military and civilian aircraft built each year. The total number built for the entire year is equal to about one day’s production at one auto plant. And there are more than 20 auto assembly plants in the US. Auto companies produce 15-17,000,000 new cars and trucks in every year, just for the U.S. market. Thus, for technology to be introduced in cars and trucks – even very expensive vehicles – cost must drop 1 to 2 orders of magnitude, or more than 90%, from cost acceptable for a defense or aerospace application. Further, parts on cars must function with essentially no maintenance. Think about how little you maintain your car or truck vs. the number of hours you drive. Yes, you may refuel every few days, or every few hours, but how often do you change oil, have a tune-up or overhaul the engine compared to hours driven? Would you fly on a commercial airplane with the same minimal maintenance schedule as you have for your car? Of course not. Despite the limited maintenance schedule, cars and trucks are expected to operate and last 15-20 years, or more. What other major piece of equipment so widely used in so many different environments lasts that long? Well, you say, “I still don’t understand why we need to bail out GM and Chrysler. Seems like the government is pouring money down a hole.” As a point of clarification, when I talk about the auto industry, I mean more than just assembly plants. The core of the auto industry is primarily component design and manufacturing. The assembly plants get all the glamour but industry guts are in components – electronics, robots, batteries, wheels, frames, tires, steering, foundries for engines and brakes and many other components. Manufacturing of components creates value. 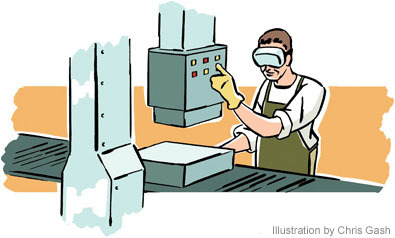 In addition, knowledge gained in manufacturing can be transferred to other industries. As a country we often overlook the need to remain competitive in producing components. The US does not need to produce all components for all cars assembled in the US. But is does need to maintain the capability of producing a high percentage of each key component. STIMULATING OTHER INDUSTRIES. The technology used in autos is directly applicable to many other industries. The demands of the auto industry for lower cost and high reliability force many suppliers to improve their technology and quality processes. A strong domestic auto industry increases the likelihood, although does not ensure, the U.S. is creating, receiving and utilizing the latest technology. Will foreign auto companies with U.S. assembly plants transfer the latest technology to the U.S.? No, just as the U.S.-companies do not export their latest technology to other countries. If there is any question about countries keeping technology at home first, one should study technology available on cars sold by Toyota and Nissan in Japan compared to technology available in the US. Frequently the technology is not available in the US for 2-3 years after being introduced in Japan. 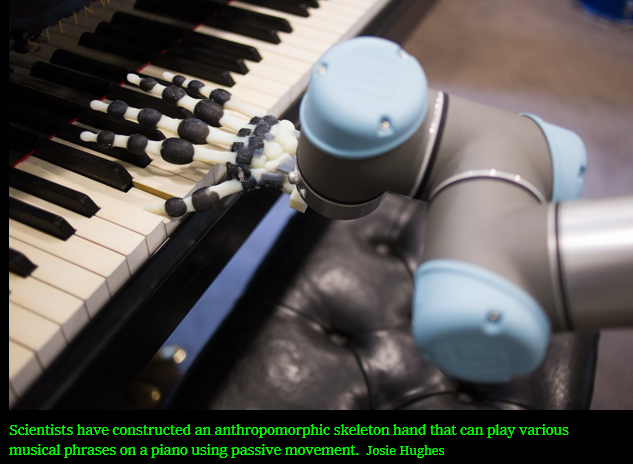 Further, some technology breakthroughs have a long-lasting impact. An example is the effort by GM in the early 1990’s to develop and introduce an electric vehicle, known as the GM EV1. While GM was praised for introducing the car, and skewered when stopping production, the advances in technology developed for the EV1 program became the foundation for many of the electronics available in cars and trucks today, 20 years after the EV1 concept car was introduced at the Los Angeles auto show. Yes, GM deserves criticism for canceling the program. But GM deserves praise for advancing automotive electronics, which in turn led to the use of advanced electronics in many non-automotive applications. The strong domestic auto industry creates advancements in technology that benefit the auto industry and all segments of industry and everyday consumers. Advanced technology applied in non-auto industries keeps US companies competitive worldwide. Exports create jobs. If you think transportation-driven technology is not important to other industries, think about productivity in agriculture, raw materials, manufacturing, distribution and other industries. Most of the productivity gains were greatly influenced by demands first met in the auto industry. Without such productivity, the US output and incomes would fall toward lesser developed nations. Yes, I know, Silicon Valley is great. But the country needs to translate the ideas to generate wealth for US society. Manufacturing generates wealth, services do not. Knowledge without manufacturing does not create wealth. NATIONAL SECURITY. Since foreign-based auto companies do not transfer the latest technology – and why should they – without a strong domestic auto industry, the U.S. will fall behind in technology development for everyday products and manufacturing efficiencies. This in turn will lower potential GDP growth and personal incomes. More importantly, however, without a higher-volume domestic auto industry to spread cost, will the country be able to afford the cost for developing new technology used primarily for defense and aerospace applications? Probably not unless we raise taxes and lower incomes. SMART INVESTMENT. Taxpayer dollars to ensure a vibrant domestic auto assembly and component manufacturing industry are dollars well spent – a smart investment. What would the hue and cry be from these same critics of the GM and Chrysler bailout if the defense and aerospace industries began outsourcing critical defense weapons systems to such countries as India, China and Japan? If you still have doubts, name one country worldwide that has sustained growth in GDP and real growth in consumer incomes without a strong manufacturing base built around a strong automobile industry? Call me when you can name one. During summer 2009, which was still early on in the Great Recession, Congress was considering whether to bail out Chrysler and General Motors. Many people stated that auto companies and auto production did not need to be in the US. In fact, some argued US consumers would be better off if auto manufacturing was done in lower-cost countries outside the US. I’m not sure where these people took Economics 101 but all the economics I have studied indicates manufacturing has a direct and positive impact on wealth creation for a country. Wealth for a society is created one way — taking materials and processing them so the end-product is more valuable to buyers than the individual components. The concept of creating societal wealth through manufacturing is apolitical. Whether your political beliefs are left or right, whether you are a fervent capitalist or fervent socialist, creating wealth for society works the same way – manufacturing. Printing money can create wealth in the short term. So can mining and selling natural resources. But those resources often finite and are of value only, and only, if processed into another product. For example, crude oil per se, has no value. Oil is feed stock for plastic and has value to companies manufacturing plastic products. Oil, when refined, has great value today for use in transportation, heating homes and generating some electricity. Oil would have much less value if more electricity and transportation were powered by non-fossil fuels. Gold has no inherent value. Gold becomes valuable when it is processed into jewelry, part of electronics components or other products. Gold’s use as currency is arbitrary. A society’s currency could be based on certain types of rocks…or even paper, as it is in most countries today. Understanding how manufacturing creates societal wealth is not difficult. For example, think of the manufacturing process as starting with iron ore – a bunch of rocks. Through various steps the rocks are formed into steel. Through another series of steps, the raw steel is turned into hoods and fenders for cars/trucks or support beams for industrial buildings. Each step in the manufacturing process adds value to what was originally a pile of rocks with no inherent value. Farming, in a broad sense, is also manufacturing. Farmers take seeds and through various steps turn the seeds into corn or soybeans. The farmer then sells the corn to others who process it again, turning the corn into cereal or bio–fuel for cars/trucks. Each time the end product becomes more valuable. Each step in the manufacturing also creates jobs. At each step, part of the “added value created” is distributed to workers through wages and owners through wages and dividends. What about companies that offer services? Do these companies create wealth? Answer: No. Service-related companies do not create wealth. These companies/organizations merely transfer money from one person’s pocket to another person’s pocket. Yes, some individuals may make more money in the transaction but others lose an equal amount. Thus, with services there is no net gain in wealth for society…unless the service makes the manufacturing sector more productive. 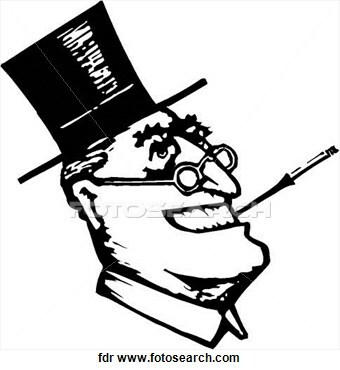 Medical care, for example, is a service that does not create societal wealth. The doctor and medical staff may be economically better off after some procedure, but the patient, the insurance company and other taxpayers have transferred funds to the medical staff. Unlike manufacturing, the doctor, nurse and others involved with patient care, created no wealth for society – they merely picked the other person’s pocket. Before you become enraged, just think about medical care. For a society, the cost of medical care is, in many ways, like a tax. The cost of medical care transfers wealth from one pocket to another but does not create wealth overall. However, like some taxes (note the term “some taxes”, not “all taxes”), medical care is necessary to sustain a vibrant and productive society. Retailing is also a service that creates no societal wealth. The primary benefit of retailing is a convenient venue to purchase manufactured goods. While most people think of retail stores, the “stores” can be physical structures, internet sites, business-to-business sales representatives or even door–to-door sales people. A new store does not create new jobs unless the market is under–represented with retailers. A new store does not cause people to spend more money, but merely reallocates the money being spent among other retailers. The reallocation is particularly true for such retailers as Wal–Mart/Sam’s Club, Amazon et al. Wal–Mart/Sam’s Club draws customers from other stores and often pays lower wages than other stores. Further, most of the merchandise in Wal–Mart is manufactured outside the US. Shoppers at Wal-Mart create a double negative impact on wealth creation by (i) supporting lower–paying jobs that replace higher paying jobs at existing local retailers and (ii) sourcing products outside the US at the expense of manufacturing jobs in the US. The example should not be construed as anti–Wal-Mart. However, Wal-Mart is no patron saint. If the true economic impact of such stores as Wal–Mart were analyzed, the outcome would likely be negative, not positive. Amazon has become the ”new Wal-Mart,” with even more erosion of higher-paying jobs and US-manufactured goods. As a society, we need to understand what economic policies create wealth and what economic policies merely transfer wealth between people‘s pockets. In many ways, the emphasis on service companies – banks, medical, retail – are like taxes, which transfer wealth between segments of society but create no overall societal wealth. Trump Administration and Manufacturing. The promise by Trump during the campaign to bring back former high-labor-content manufacturing jobs is folly. Yes, manufacturing is critical to create societal wealth but technology has replaced much of the labor content in manufacturing. And the use of technology to replace workers will only continue. If there is any doubt about the trend, merely look at agriculture. The implementation of technology has resulted in enormous gains in output with far fewer workers. The key for sustaining US manufacturing is not trying to create retro-manufacturing jobs but training workers help support technology for future manufacturing growth. On the surface, the comment seems fair. But what is the unemployment rate and how should we interpret changes in the rate? How Would You Behave? Situation: You own a business. Sales and profits are down. Lately there has been some uptick in sales but you’re not sure if it will last. Question: Would you start hiring people the minute sales started to pick up or would you wait to be certain sales were going to continue at a higher level? Answer: Most all business owners wait…and the behavior is logical. With this behavior in mind, let’s think about the unemployment rate. If businesses wait to hire more people until they are certain the economy is getting stronger, how should the unemployment rate be characterized – as a “leading” economic indicator or a “lagging” economic indicator? The unemployment rate is a “lagging” economic indicator – the unemployment rate does not decline until the economy is already weaker and the unemployment rate does not fall until the economy is already improving. Thus, gains in employment will come after the economy has started to improve. The chart depicts monthly changes in employment. The data points above the “zero” line indicate increases in employment compared to the previous month. Data points below the “zero” line indicate losses. 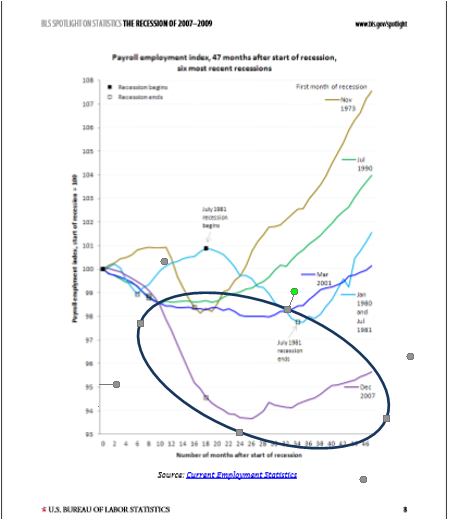 As you review the chart, keep in mind that employment is a “lagging” economic indicator so changes in overall economic activity occur before the changes in employment. The economic decline that turned into the “Great Recession” started during Bush43’s second term and the decline accelerated sharply as Obama was taking office. Early in the Obama Administration, Congress passed an economic stimulus package. These type packages, whether implemented by Republican or Democratic administrations, take time to have an effect on the economy and an even longer time to have an effect on employment. 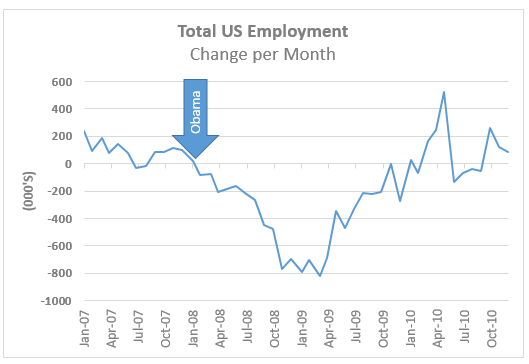 Note that beginning October 2008, about 7-8 months after the stimulus package was passed, monthly job losses stabilized and the monthly losses decreased until the beginning of 2010. Because the unemployment rate is a “lagging” economic indicator, the economy was actually starting to improve even though people were continuing to lose jobs and the unemployment rate continued to increase. While it makes for great political theater, those claiming that the economic recovery program implemented by the Obama Administration was a failure, conveniently failed to provide an accurate representation. The recession of 2007-2008 was labeled the Great Recession because the economy almost sank into a depression. So, if the job losses were significantly worse than previous recessions, wouldn’t you think any economic recovery should take longer? Not if you’re a politician of the opposing party. For all those criticized the Obama Administration for not creating more jobs, the critics should remember who was president when the recession started – and why the recession started. Enough politics. Just what is the unemployment rate? The unemployment rate is total number of people looking for work but unable to find work divided by the total work force. The result is “unemployment rate” or percent of the workforce considered unemployed. Part of the confusion lies in the definition of the “total work force.” Total work force is the sum of people looking for work and people currently employed. If people are unemployed and have given up looking for work, they are not considered part of the workforce. Huh? Really? Yes, really. Here’s an example. Situation A. 100 people are available to work – 90 are employed and 10 are unemployed and all 10 are actively looking for work. Thus, the workforce is 90+10, or 100. The unemployment rate is 10.0% (1-90/100). Situation B. Same 100 people as Situation A. However, after several months, 5 out of the 10 people unemployed cannot find work, become frustrated and quit looking for a job. What happens to the unemployment rate? It goes down. Yes, down, even though the total number of people stays the same. The unemployment rate decreases from 10.0% (10 unemployed out of 100 in the workforce) to 5.3% (5 unemployed out of 95 in the workforce.) The unemployment rate decreases even though the number of people without work stays the same. Even more confusing is when the economy improves, those who previously quit looking begin looking for jobs. What happens to the unemployment rate? The rate may actually increase even though the economy is improving. Situation C. Start with Situation B where 10 people were unemployed but 5 of the 10 quit looking for work. Now the economy starts to improve and the five people who quit looking start looking again. Only 2 of the 5 who quit previously find jobs right away but everyone who was not employed is again looking for work. Another problem interpreting the data is the unemployment rate includes workers who have jobs but are working less than full-time. These people are counted as “employed.” Using the same 100 people, if 15 are working say 30 hours per week instead of 40 hours per week, the 15 would be counted as “fully employed,” even if weekly income has been reduced. While these calculations are not hard to understand, the method used to calculate the unemployment rate is not often explained, especially the effect of “under-employed” or “quit looking for work.” Understanding the methodology will help you explain to others why results of programs to reduce unemployment always lag economic growth.